My Carnival Destiny Cruise vacation was my family's fifth Caribbean cruise, but our third cruise with Carnival Cruise Lines. My cruise experience was great! The food was delicious. We ate in both the buffet restaurant and the formal dining room. Our dining room was called the Galaxy Dining Room. The food in both places was good, but I preferred eating in the buffet restaurant called the Sun and Sea Restaurant. Our ocean-view cabin was cool, but the TV was kind of small. 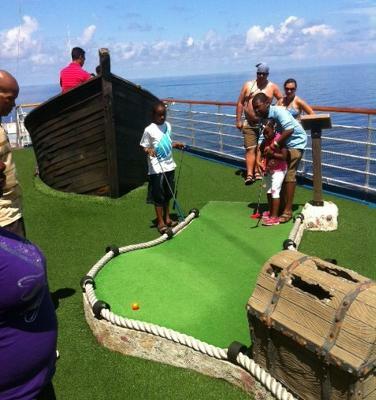 Some other things I enjoyed on board the ship were hanging out in the pool with my brother and others, playing mini-golf with my family, and going down the huge slide. Two things I didn't like about the cruise were the place for kids and the jogging track. They were both boring. 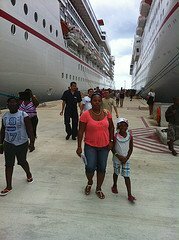 Our cruise ship visited Ocho Rios, Jamaica, and Grand Cayman, Cayman Islands. Jamaica was fun I guess. My family went to the beach for a little bit. 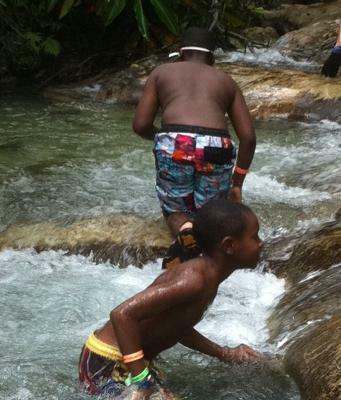 Then, we left to go climb the famous Dunn's River Falls. It was hard and very slippery. I slipped about three to five times. After Dunn's River Falls our driver took us upon a hill overlooking Ocho Rios Bay. It was a beautiful view. From there, we returned to the ship. 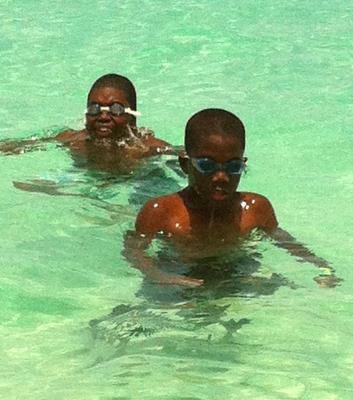 Grand Cayman was fine. The only thing we did there was visit the beautiful Seven Mile Beach. At the beach, the water was so clear that I could see the bottom. When I dove under the water with my goggles I saw little fish. My Dad's cousin, who lives in Grand Cayman, bought us lunch. After lunch we went back into the water for a few minutes and then left. I liked my Carnival Destiny cruise vacation. It was a fun cruise, and the ship was the second biggest one that I have been on. Join in and write your own page! It's easy to do. How? Simply click here to return to Cruise Story.